The landscape of philanthropy is changing. It’s not about the logos anymore. Large-scale volunteerism projects, product donations, disaster relief strategies, issue-awareness campaigns, research and development, and public policy work are all standard undertakings for today’s top corporations. These substantial efforts combined with recent news headlines of multi-billion-dollar donations have shined the spotlight on philanthropy like never before. Now, it is time for all players in the private sector to identify the ways they can join the movement and make their companies instruments of change. THE BUSINESS OF CHANGING THE WORLD: 20 Great Leaders on Integrated Corporate Philanthropy demonstrates the profound interdependency between businesses and the communities in which they operate and reveals how every company, from a Fortune 500 like Google to a San Francisco law firm to a start-up operating from an apartment, can incorporate philanthropy into its business model and make a difference in the community. Twenty outstanding business including Steve Case, Michael Dell, Michael Milken, John Morgridge, Laura Scher, Jeffrey Swartz and Klaus Schwab share their personal stories as well as make an effective argument that philanthropy, when done strategically, attracts top talent, boosts the bottom line, and is in the enlightened long-term interest of shareholders. 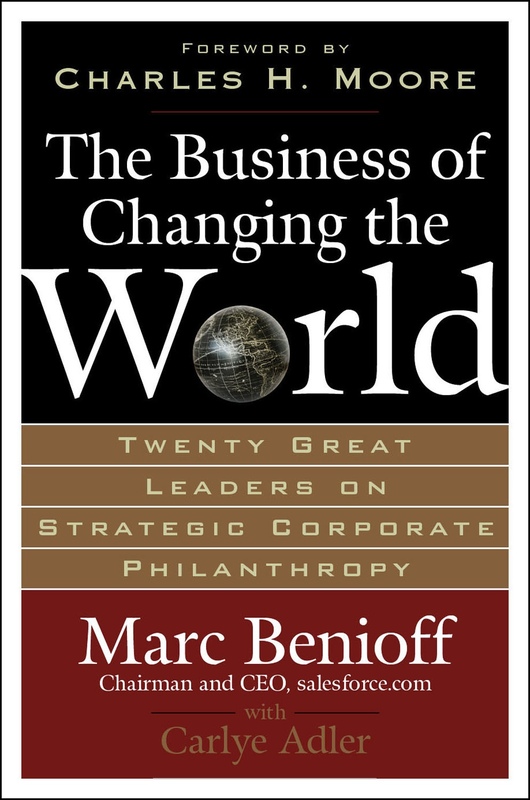 The Business of Changing the World dispels the myth that corporate philanthropy is an oxymoron. It examines a new and better way to give back and shows how with a little effort it’s possible to simultaneously grow a successful for-profit business and create positive social change. This thought-provoking book is a must read for entrepreneurs, corporate business people, nonprofit executives, social entrepreneurs, business students—and anyone looking to make a difference. -Harry McMahon, Vice Chairman, Merrill Lynch & Co., Inc.
-Masayoshi Son, President & CEO SoftBank Corp.